Well I tried to find some way I could relate this to software development or IT but failed miserably. 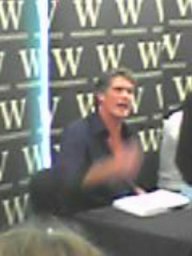 So I'll just say I had the pleasure of seeing the Hoff in person in Manchester today. Hoff was a super hero/idol/star for many kids in the school playgrounds in the 80s due to his role in the TV show KnightRider, myself included. David I know you're a fan of reading websites about you so if you're reading this just post a reply message below please! As you could imagine he was very popular and I have a old sub megapixel Sagem camera phone with digital zoom, but I managed to get a few shots. Despite my poor camera work it's clear he still doesn't look any older than in the eighties and has proven himself with his fan base to be to pulp sci-fi adventure series what Sean Connery is to Bond.